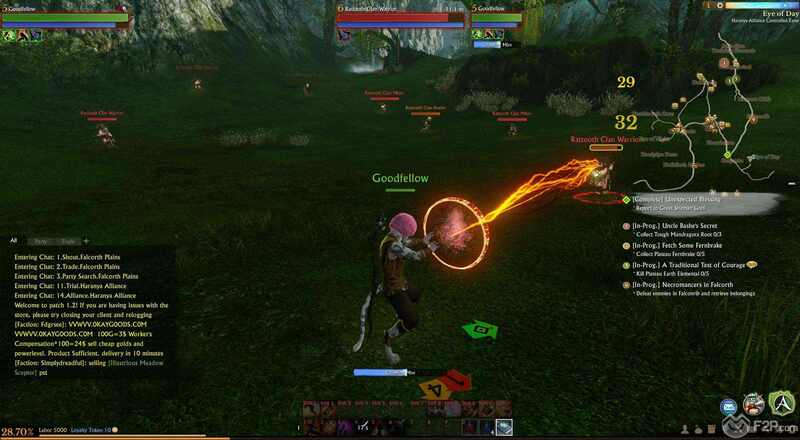 This past weekend we took some time out to check ArcheAge, the new fantasy-based Korean MMORPG published by Trion Worlds in the West for a European/North American audience. In case you don't know it, the game is currently in closed beta testing and upon release will be a fully free to play MMO without any subscription. ArcheAge is a sandbox open world MMO that allows players to raise and train up their own mount, create top end armour, build their own houses and farms, travel the world by road, sea or flying airships and fight in thrilling PVP against other players battling for territory. Taking our first look in game we got to see first-hand what ArcheAge was all about. Building up the game players are faced with four different factions/races that they can choose from; the human-based Nuin who are devout followers of Nui the Goddess of the Hereafter, the private and secluded Elves that share the continent with the Nuin but dwell within the forests. On the eastern continent the nomadic catlike Firran roam the wilds with dreams of reclaiming their former glory and the Harani who are true survivors thrust into the jungles of Mahdevi and have a strength and self-preservation that is unmatched. For our choice we decided to try out the Firran, looking over character customisation were faced with a few options though can expect to lead these on the revolves around being able to customise the face/head of our character which was a little limiting in comparison to other MMORPGs. That said what they did allow us to do with our appearance was amazing, choosing our hair and eye colour was more than just a few different selected colours and instead we were able to choose from a wide spectrum with an eye dropper, but more excitingly was the defects/scars we were able to place our characters face. With a wide selection of crossed scars, long cuts, stitches and more we were not only able to choose the style of scar but also position it on our face with pinpoint accuracy, resize it to however big or small we wanted it and also change the angle so the same straight cut scar could either be across the characters mouth, diagonal long their cheek or cutting straight across their eye giving an amazing level of detail that little more MMORPGs will copy in the future. 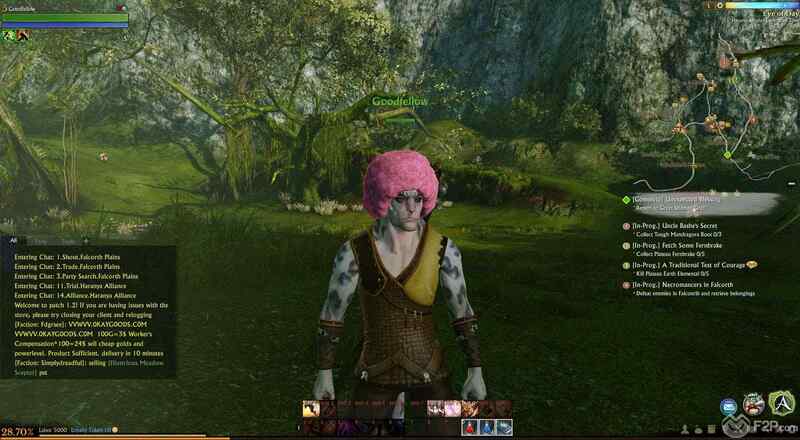 Our pink afro haired Firran made we chose to go with the Occultist class in the hopes of summoning a wraith, as per the class description, unfortunately this is a later level skill much to our disappointment. One of the interesting things with the game is that players choose their starting class and are then able to open up to further skill sets, 10 to choose from in total ranging from typical assassin, defensive, healing skill sets to some more unique ones such as Songcraft and Witchcraft. These mix-and-match skill set combinations allows players to create their own unique classes, which they can further customised by adding skill points into particular skills to improve them and ultimately be set their pasts at any time to try out something different. Stepping into the game there was a fairly extended cut scene with illustrated visuals and a narrative over the top to set the scene and give the players an idea of the race they had chosen, which was well done, interesting and really helped set the tone. 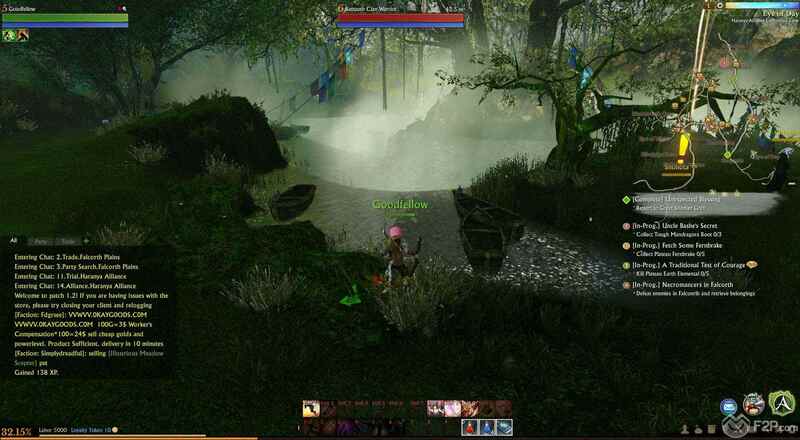 Once we’d logged in the game itself had a very typical modern MMORPG feel about it, huge yellow exclamation marks above NPC’s heads signifying they have a quest and following waypoints using the overhead mini map or the multiple quest markers that float around the character giving you an idea of where the next active quests are. The main story arc progressed for our Firran character it would occasionally transition to illustrated cut scenes to explain some more background lore whilst keeping it in the scope of the active quest. Combat was fairly simple and nothing particularly out of the norm from what we have grown accustomed to from other MMORPGs, the user interface worked well and was unobtrusive to give as much game real estate as possible. This included a constant transparent overhead mini map and a character sheet that when activated would open your main stats window in the top left corner and your equipped armour and gear as floating icons around your character so players can quickly switch in and out their gear without having to take their eye off the battle and whilst you were still moving around in the game, as opposed to the view blocking windows that we often see. As a first look checking out the initial starting zone the game looks pretty solid and offers a lot of potential, more so in the features and promises they make for the later game content such as huge scale PVP battles, naval combat and the personalised homes and farms that players will be able to build up. From our time in the game we can imagine ArcheAge being anything but a complete smash hit with players. If you want to know more about this title, click on the "info" button below. And FYI, soon enough we'll publish a first look commentary video, so stay tuned. 3 Comments - "ArcheAge Closed Beta Review"
They do have a subscription there, you know. Which kinda plays a big part too. Even though, you can play the game totally for free. Subscription is optional and it only features some in-game benefits. Archage is a terrible game, the land is all taken, you have to subscribe or work very hard ingame for patron status which is required to do much of anything real. They allow greifing, they call it Emergent gameplay where players can ruin your day and you cannot do anything about it. This game is a giant scam/money grab by trion dont play it if you know whats good for you. Unless you enjoy being greifed and investing in pay to play pay to win game types. Trion is a company of all Top EA people so that is why its so buggy crashing and broken, the guild features are kick, promote and nothing else you cant even message guild members. This game is a joke a terrible game investigate before you get robbed.